In 679, the Mercian Queen Osthryth embarked on the ambitious plan of transferring the remains of her uncle, Saint Oswald of Northumbria, to the Abbey of Bardney in the Kingdom of Lindsey, now in Lincolnshire. Oswald, despite his sanctified status, was a polarising figure in seventh-century Britain. As a king he had ruled over Northumbria as well as over the territory that encompassed Bardney through might of conquest. This fact was not lost on the inhabitants of the abbey, who according to Bede had ‘retained their ancient aversion to him, even after his death’. The abbot of these disgruntled monks was a man named Hybald and it is to Bede that we return to begin his story. The Ecclesiastical History describes Hybald as a ‘most Holy and content man who was an abbot in Lindsey’. This generous but relatively underwhelming presentation is consistent with Hybald’s life before the arrival of St. Oswald’s remains. All that is recorded of him is his humble disposition, the location of, and his position within the church. Indeed, he is rescued from obscurity through his friendly association with a more prominent seventh-century saint, Chadd, whose death was foreseen by Hybald. Chad’s death in 672 left Hybald to his management at Bardney until the arrival of Oswald’s body seven years later. Hybald and his monks were convinced of the injustice of the remains being imposed on the abbey that had formerly been annexed by the Oswald’s Kingdom and continued their opposition to the wishes of Osthryth, going as far as locking the remains and its retainers outside the abbey during the night despite ‘knowing him as a holy man’ as described by Bede’s account. It is this awareness of Oswald’s own divinity that eventually resolved the issue after a large beam of light was reported as shining from the cart that had transported the remains and continued up to the heavens. Following this development, Hybald and his dependants had altered their thinking and elected to accept the remains, enthusiastically praying that ‘those relics, so beloved by God, might be deposited among them’. This change of perspective and political coup for Osthryth also resulted in allowing for Hybald to be propelled into the religious limelight of the age in a capacity that he did not have before. Prior to this he had been an abbot, remarkable only for his mysterious ability to predict his saintly friends’ demise and otherwise indistinguishable from another of his standing. His status was now drastically altered. He had been a participant witness to a miracle involving the renowned Saint Oswald as well as living members of the Mercian royal family. He had also made it considerably easier for himself and all those involved by bowing to the pressure and alleged miracle summoned by a disgruntled Saint Oswald, making him the man who had facilitated the smooth transition of the remains which undoubtedly endeared him to the senior Merican leaders. The incident had resolved itself when the heavenly beam informed all present that the Queen’s decision to move the body had divine favour. 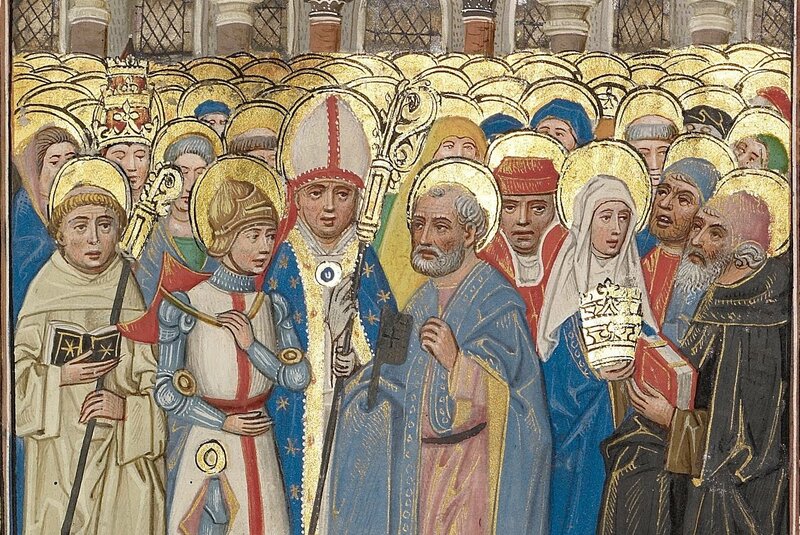 Despite this, the event did not serve as a reprimand for Hybald, instead, it represented his induction into the communion of early-medieval saints. The pillar of light served to gently illuminate the sanctified status of Oswald’s remains and their right to reside at Bardney. Hybald’s integrity was not called into question by the higher power, merely he was corrected in his stance. His companionship with St. Chadd is also presented as having transcended the death of that saint and so Hybald was elevated into an elite clique of premier saints through affiliation with Chadd. After this event, Hybald’s narrative changed course after he decided to follow in the path of Saint Chad and assume the life of a hermit. This was a familiar protocol for Anglo-Saxon clerics and holy men who wanted to develop spiritually and consider the place of their faith away from the distractions of wider society. This does not necessarily imply that he neglected his position at the abbey and his spiritual development likely followed the pattern of visiting missionary outposts such as small churches to educate men there before travelling back to his busy religious house. Bede has a final piece of information about this time in Hybald’s life, informing that he was prone in his dialogue to talking about the founders of the early English church. This analysis is compounded by the existence of three churches named for him in the local area that were in existence during his lifetime. The discovery of his remains in 1864 inside the parish church of Hibaldstow further suggests that the saint maintained an active correspondence with these places during his hermitage in later life. The image of Hybald that emerges from this is one of competence in maintaining a large religious organisation and having the pragmatic reasoning to realise that contact and communication was necessary. This is a repetition of the part he played in the event of 679, recognising the inevitability of Oswald being interred in Bardney through good means or bad and the potential benefits to his abbey and to himself by bowing to the pressure of Queen Osthryth. Hybald also continued to distinguish himself through his capable administration of Bardney as opposed to having a list of numerous miracles attributed to his life as was the tradition for saints at the time – Hybald’s friend Saint Chadd was allegedly ‘seen as a saint even before his death’. Indeed, Hybald’s canonisation was dependant upon the answered prayers of healing that were performed on request at his shrine. In this sense, he returned to the relative obscurity of his not unimportant abbey and the more pressing business of guiding the spiritual development of its inhabitants. It is perhaps fitting that Bede’s verdict of a ‘most Holy and content man who was an abbot in Lindsey’ is the lasting epitaph for Hybald as it is to this state of affairs that he returned after the event that earned him recognition across Anglo-Saxon Britain. Hybald continued in his duties until taking ill and despite a reportedly robust constitution, he died in 690 and was interred in the church of Hibaldstow. A shrine was erected at this place where pilgrims would pray to the abbot for medicinal remedies.